Welcome to our review of Cabela’s Warden, a takedown recurve bow manufactured by Fleetwood Archery. This particular model features a riser constructed of walnut, white oak, maple, and garin, with limbs made from a wood core with black fiberglass laminate. It’s a 62″ recurve, available in either left- or right-handed models. It’s a lovely design, so let’s take a look and see how it performs. What’s Comes In The Box? Most notably, you will not find a bow stringer in the box, so I strongly recommend you pick one up. Stringing a bow without one is dangerous and leads to inaccurate shooting. How Difficult Is the Cabela Warden To Assemble? The Warden is a recurve, so it’s easy to assemble. Attach the limbs to the riser with the included hardware, string the bow, and you’re good to go. Unfortunately, you need to look carefully at the threaded inserts for the limb bolts and ensure they are securely fastened within the holes. The first Warden I received had the bolt holes drilled too far, and the inserts weren’t properly glued into place. Good news for newbies and accessory fans: the Warden is predrilled with holes for a stabilizer, sight, quiver, plunger, etc. I prefer more natural, instinctive shooting, but if you plan on tricking out your bow, it’s a good idea to do so right after assembly. The right accessories can, after all, making the learning process go quite a bit smoother. The other nice thing about this particular recurve is that it’s short enough to be easy to handle in a boat for bowfishing. Outside of hunting season, I’ve mounted my reel to the stabilizer hole several times and used the Warden quite effectively to bring in a good seafood dinner. Once again, be sure to check the threaded inserts. They tend to pull out easily, but a bit of epoxy solves that problem. It shouldn’t be necessary, though, since the manufacturer should take care of it. Once you’ve got your extras installed, you can proceed with the process of tuning your new recurve bow. How Accurate And Powerful Is the Warden? This model is available in draw weights from 40# to 50#, in five-pound increments, so it’s about as powerful as you can find in a recurve bow. If you aren’t sure which strength is right for you, you should take a look at our guide on selecting the right draw weight . As far as accuracy goes, it all comes down to your skill level. This recurve is well-made and shoots straight, so it’s quite good for an inexpensive bow (rivaling even more expensive models). I was able to maintain 2.5-inch groupings from 40 yards, and I would expect less experienced archers to be able to readily use the Warden to learn the sport. I found it to be very forgiving of poor stance and technique. Is This Recurve Bow Right For Hunting? Available in draw weights from 40# on up and measuring just 62″ from limb tip to limb tip, Cabela’s Warden is perfectly suited for hunting medium- to large-sized game. It maneuvers easily in a tree stand or ground blind, and is light enough to carry through afield without getting fatigued. I was able to use this particular recurve to take down a 12-point buck with a clean pass-through shot from 50 yards. Can a Beginner Enjoy Shooting the Cabela Warden? If you’re a beginner with enough upper body strength to pull at least 40 pounds of draw weight, the Warden is well-suited for you. It’s forgiving of poor stance and technique, is accessory-ready, and is easy to assemble and disassemble. The only downside for beginners is that the bow vibrates quite a bit, which will cause hand fatigue quite quickly and might prevent you from enjoying extended practice sessions. What Arrows Should I Choose to Use With the Bow? What arrows you decide on depends on preference and what you’ll be using the bow for. Make sure you carefully read our guide on arrow selection, since it goes over the basics of what you need to think about and look for. Does This Bow Have Durable Limbs and Riser? The bow itself, as in the limbs and riser, are quite durable. However, as previously noted, the threaded inserts for the limb bolts and accessories may not be properly glued into place. Check carefully for this, and if you have any doubt, get in touch with Fleetwood Archery. Their customer service folks are very helpful and eager to make things right with your purchase. What Strings Will Fit This Recurve? The limb tips on the Warden are reinforced, so feel free to replace the included Dacron string with a Flemish or Fastflight string. This recurve takes an AMO–62 string, with an actual length of 59 inches. At just under two and a half pounds, this is a fairly lightweight recurve. I’ve definitely held lighter, but it has just that right amount of heft to feel good in your hands. It’s also quite easy to handle and maneuver. How About the Noise Factor? Here’s where the Warden really fails to shine. It is noisy and vibrates a lot. It’s a decent enough bow, and string silencers do help bring the noise down, but long periods of shooting with this recurve become tiring very quickly. Once I had it properly tuned, it was at least quiet enough not to cause the deer I’ve gone after to string-jump, but just barely. Thanks for checking out this review of Cabela’s Warden recurve bow. It’s a budget model, to be sure, but has real potential. Just watch out for those threaded inserts working themselves loose. Other than that, it’s an excellent hunting bow that can even do double-duty for bowfishing. The nicest thing is that the limb tips are reinforced, so you can use a Fastflight or Flemish string with the bow. 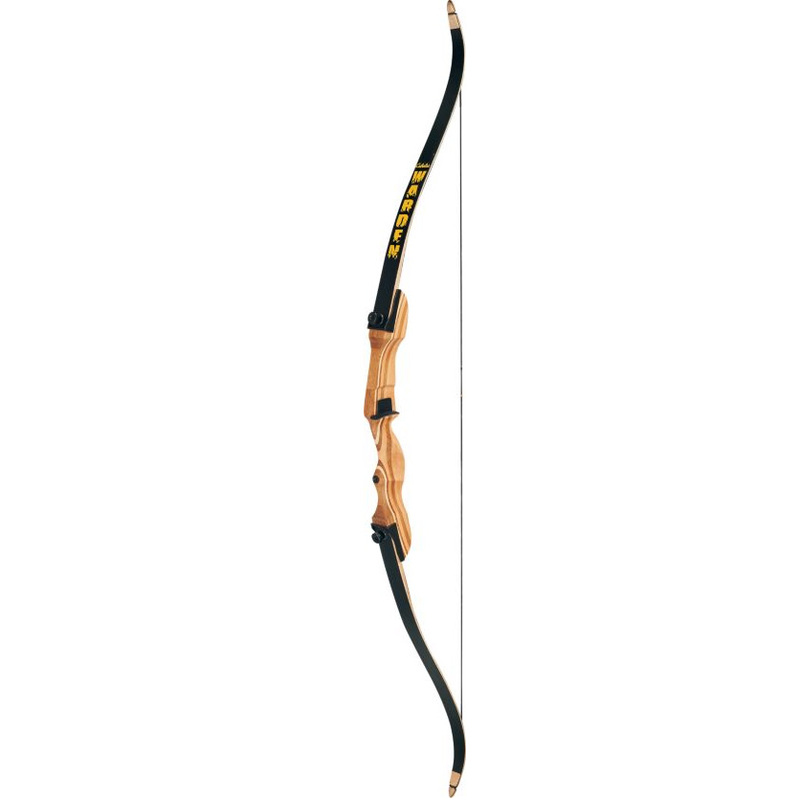 Take a look at current price on the Cabela Warden Recurve Bow if you’re interested in buying. I have the 50# version. I am a beginning archer. I was wondering if it would be appropriate or even possible to get lighter limbs for this riser. I think that I may have been talked into getting a bow too heavy for a beginner. Thanks for any advice you could muster!